Danny Biggs, two-time F-TR National Champion, decided to shoot Open Class at this year’s 2010 F-Class National Championships in Sacramento. Danny did very well, finishing third overall in F-Open with a score of 1324-67X. Danny’s X-count, the highest of all competitors, was 10 Xs higher than F-Open winner Derek Rogers and runner-up Ken Dickerman, who both finished with 57X. 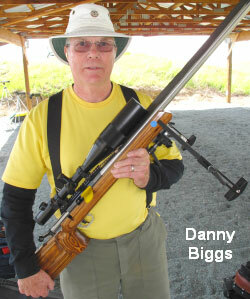 While most F-Open shooters used a front pedestal rest, either a joystick design or a center column pedestal with remote-adjustable windage top, Danny used a wide-base bipod, as he had done at past Nationals in the F-TR class. But Danny’s bipod was very special. It is a prototype, modified Sinclair design with height adjustment via a central, vertical-axis knob. As you can see from the pictures below, the left and right bipod legs are attached to a T-shaped silver (aluminum) bracket. This bracket moves up and down as the silver knob is turned clockwise or counter-clockwise. As the knob turns, its threads pull the T-shaped bracket up and down relative to a center block of aluminum bolted to the bipod’s attachment to the rifle’s forearm accessory rail. With this system, Danny can easily reach forward and make precise adjustments in elevation. Note that the Sinclair bipod’s secure rail attachment is retained and Danny can still adjust rifle cant (tilt), using the rear push-button handle. This rear handle functions like a Pod-lock allowing the rifle to be tilted a few degrees to one side or the other to compensate for side-sloping terrain. We watched Danny shoot with this heigh-adjustable bipod, and it worked superbly. With its wide foot-print, the bipod is ultra-stable. During recoil, the ski-type feet slide evenly straight back. Danny was able to quickly dial in a little vertical, as needed, during his string of fire. This gave him more precise control over elevation than other bipod shooters who had to slide their guns forward or backward or pinch the ears of their rear bags to make small changes in rifle elevation. Wondering “Where can I get one?” Unfortunately, the Biggs Bipod adjuster is not in production yet, and we don’t know for sure if this design (or something like it) will be added to the Sinclair Int’l F-Class Bipod in the future. But Danny Biggs certainly demonstrated that the concept works superbly. We expect micro-adjusting vertical controls to appear on other F-Class bipods at future matches. Share the post "Danny Biggs’ Height-Adjusting F-Class Bipod"
Or you could put a joystick on your bipod. I think a joystick on ski-pod would be great, if a guy could make weight. It would be awesome on moving varmints. Someone do it!